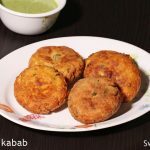 Dahi kabab recipe – A restaurant style snack. Dahi kababs are also known as dahi ke kabab. 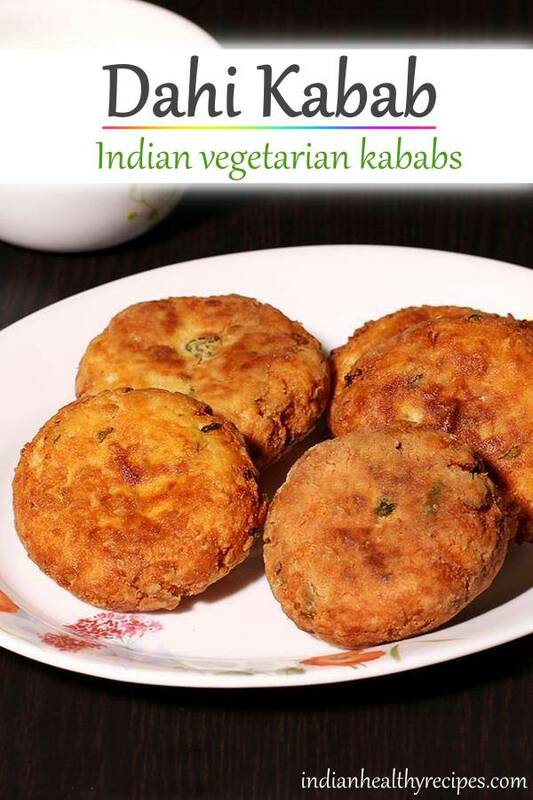 They are quite a common kind of vegetarian kebabs eaten in Northern India. 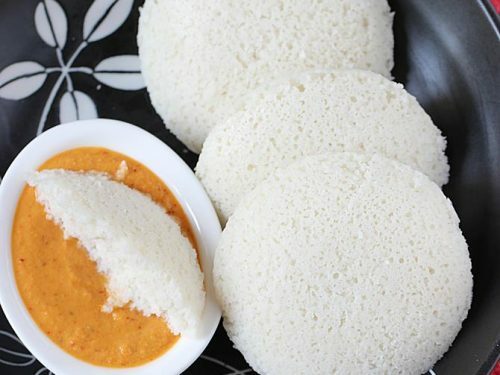 These are made of hung curd, paneer, flour and basic spice powders. 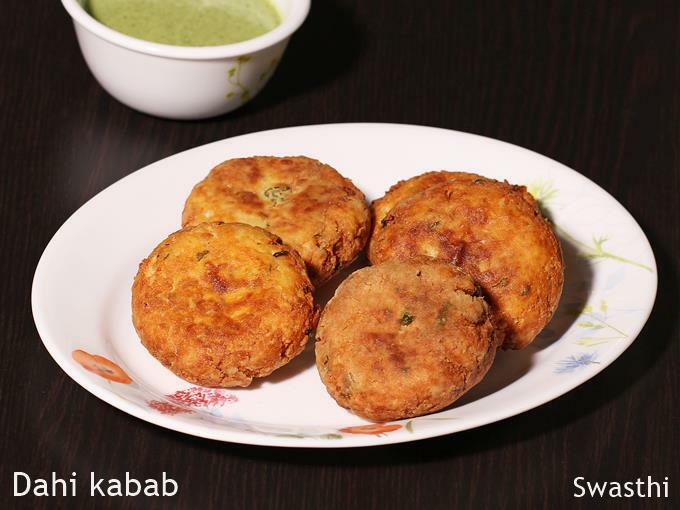 Dahi kabab are mostly found on the North Indian restaurant menus. They are loved by many for their soft mouth melting interior texture while they are crisp from outside. These are quite rich in taste and texture. So dahi ke kabab are great to make on occasions like when you have guests home or for festive meals. Dahi kabab are best served as an appetizer with green chutney or mint kebab chutney (recipe 2). Kebabs are usually shallow fried, grilled or pan fried. However dahi kabab are not good to pan fry. As they turn too soft & do not cook well from inside. They taste delicious even when grilled in oven. The key to making the best dahi ke kabab is to use fresh curd that is not sour tasting. 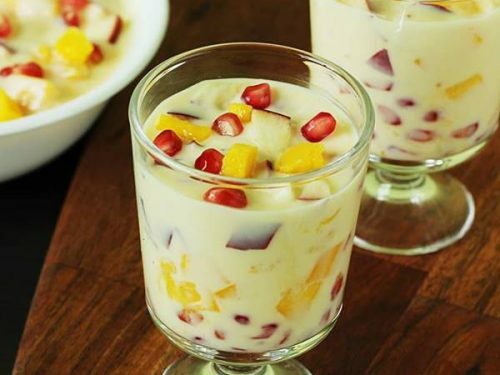 If dahi has even a slight sour flavor it will ruin the entire dish. Also using paneer and hung curd that has no dripping whey is very important. This helps to prevent the kababs from soaking up lot of oil. 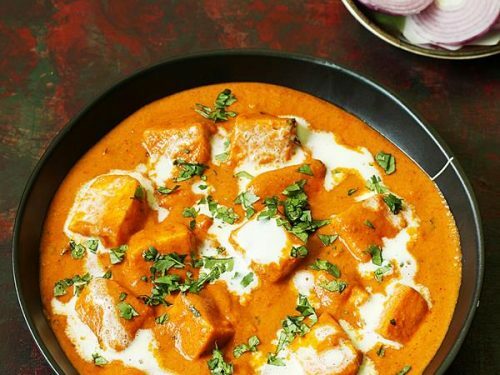 Paneer adds a texture to the kababs so do not skip it. Otherwise the kababs will taste like curd and flour dough. To make dahi kabab I have used home made paneer and dahi. You can also use store bought ones for convenience. 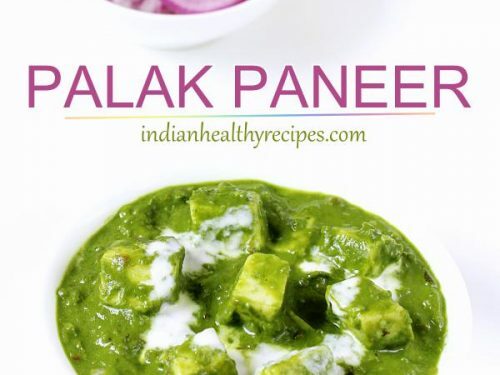 I made the paneer the previous night and hung it to get rid of the whey completely. Similarly I made the hung curd the previous night and refrigerated both of them. Do use a good flavorful garam masala otherwise the kababs will taste bland. 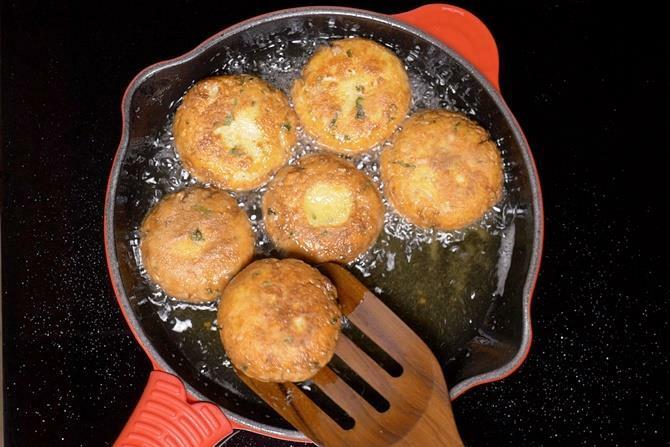 Dahi kabab are shallow fried kababs made curd & paneer. 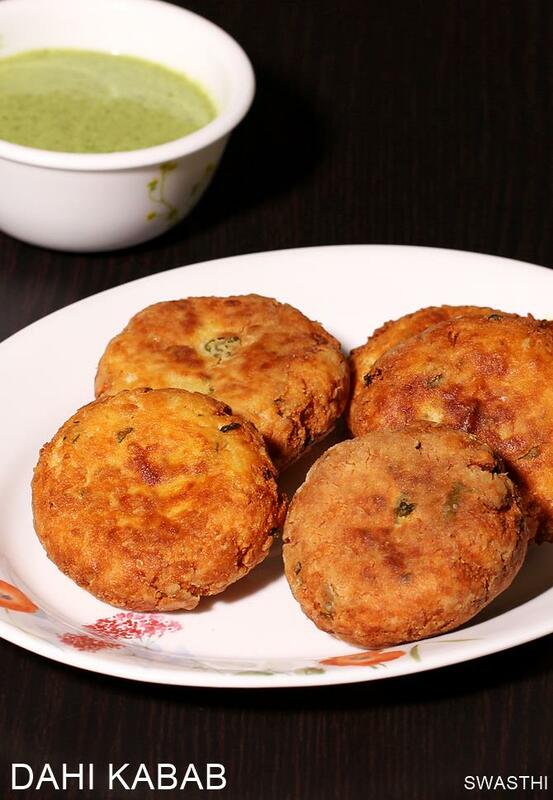 This restaurant style crispy dahi kabab are eaten with green chutney. 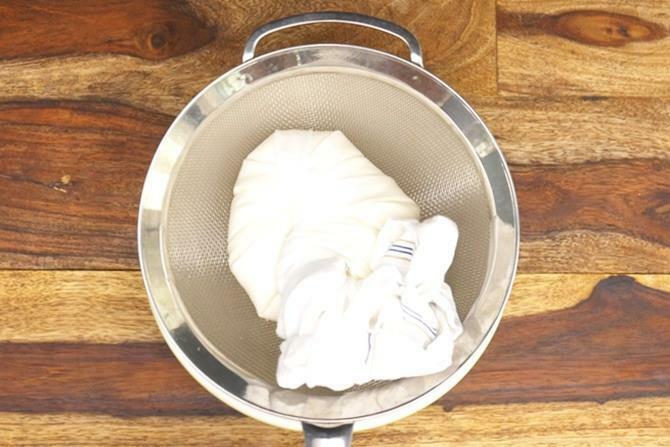 Place a clean muslin cloth over a sieve or filter. Pour the curd and bring together the edges of the cloth. Then wring the cloth to drain up excess whey from curd. Place a heavy object like 2 to 3 ceramic bowls over the curd pack. Refrigerate 12 to 14 hours. The whey drips and gets collected to the bowl. Hung curd is ready. 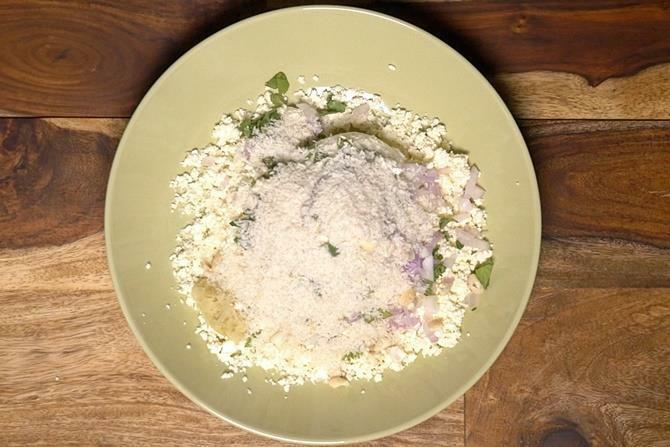 Crumble paneer or bread crumbs and add it to a mixing bowl along with hung curd. 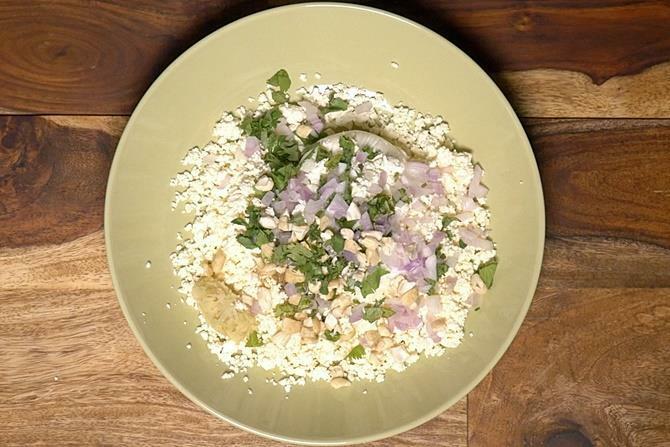 Add all the other ingredients – ginger, garlic, chilli, garam masala, onions, cashews and coriander leaves. Mix well just to make a non sticky dough. 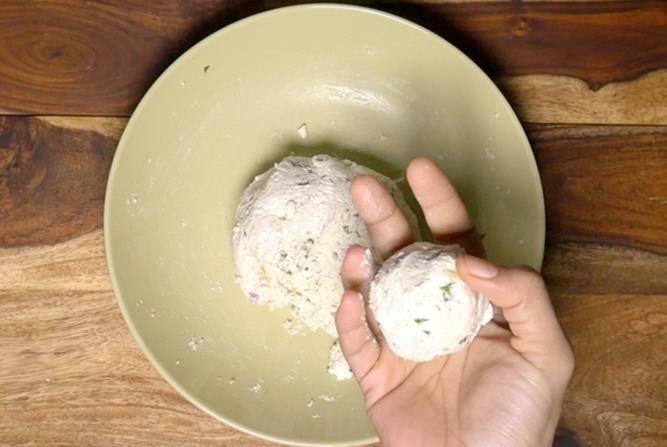 Divide the dough to equal sized balls. Flatten them. Then roll them in besan or any flour you prefer. Shake them off gently to remove excess flour. Set aside for 5 to 7 mins. Heat up oil for shallow frying. When the oil is just hot enough, slide the kababs one after the other. Next fry them on a medium flame. Flipping to the other side when one side turns golden. Fry all the dahi kababs until golden and crisp. Serve dahi kabab hot with green chutney or mint chutney. 1. 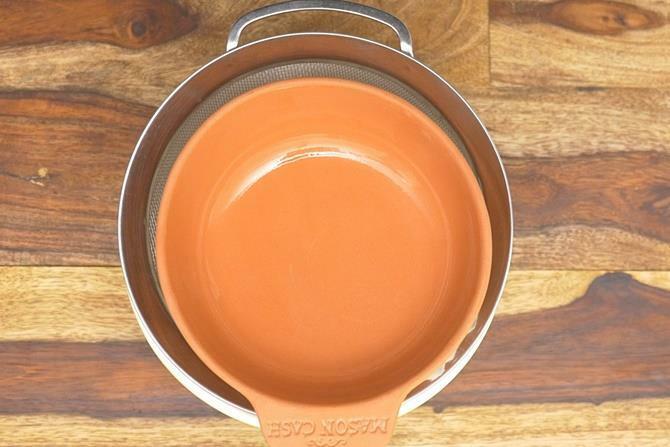 Place a sieve over a bowl and line it with a muslin cloth. 2. 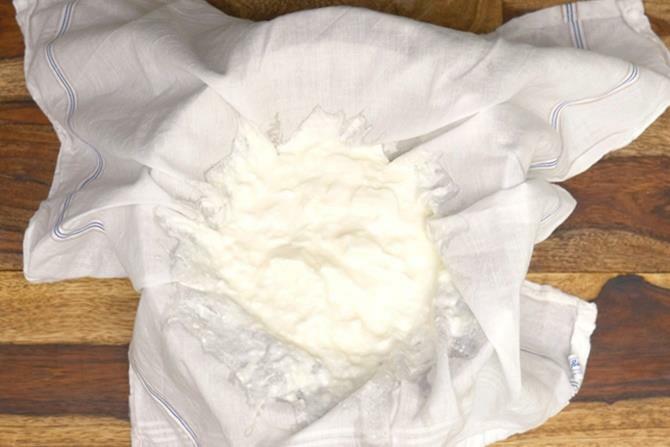 Pour 2 cups of fresh curd to the cloth. Bring together the edges and gently wring to drain up excess whey. 3. Leave it on the sieve. 4. Place a heavy bowl or a couple of bowls over the curd pack. This helps to remove the excess whey completely. 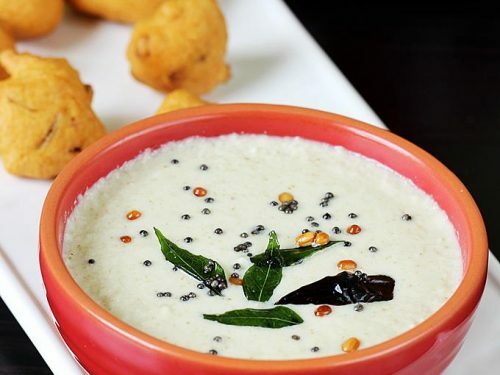 Refrigerate for 12 to 14 hours (everything together – bowl, seive, curd along with the weight). 5. 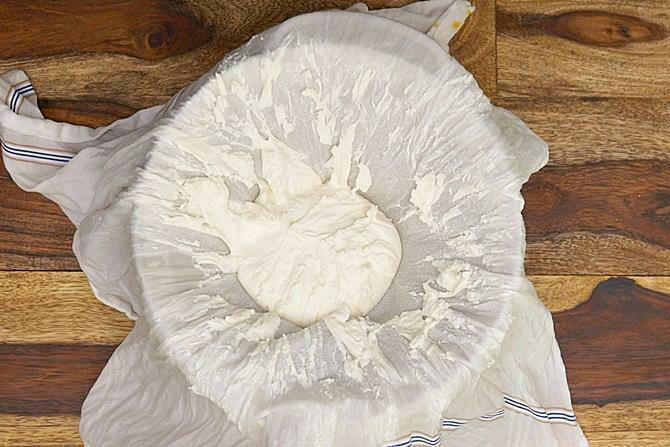 Hung curd will be ready. Make sure it has no more whey in it. 6. Add that to a mixing bowl. Also add in crumbled paneer, ginger paste, garam masala and salt. 7. Next add onions, cashews, coriander leaves and green chilies. Since we do not use red chili powder here add enough green chilies . 8. Add bread crumbs. I used about half cup. 9. Bring everything together and make a ball. Make sure you do not knead it at all. Otherwise moisture from onions begin to release. Make sure salt, chilli spice and garam masala is good enough. 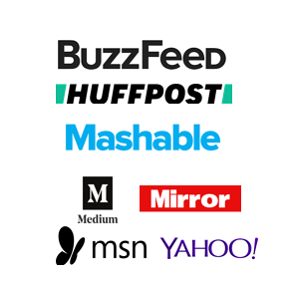 Otherwise you can add them now. 10. The mixture has to be non sticky. As you can see in the picture the mixture did not stick up to my fingers even though I did not grease my fingers. Otherwise dahi kabab will soak up oil. 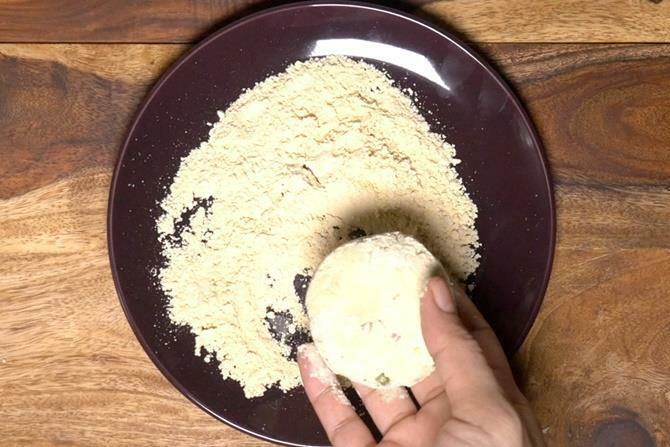 If the mixture is sticky, then use more bread crumbs. Make equal sized balls. 11. Next flatten and then join the cracks if any. 12. Finally roll all of these in besan. 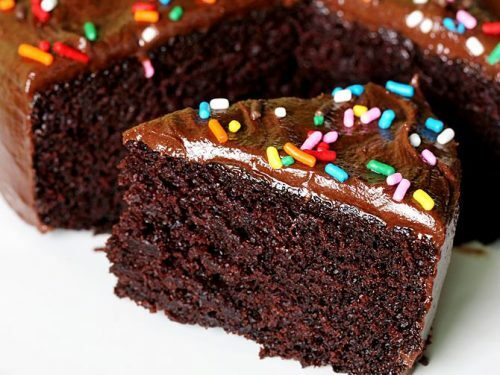 Shake off the excess flour. This prevents the oil turning messy. Set aside for 5 to 7 mins. 13. These can be grilled on a grill pan or in a preheated oven. They can also be shallow fried. Heat the oil on a medium flame. Drop the dahi kababs one after the other and fry on a medium heat. 14. Lastly flip. 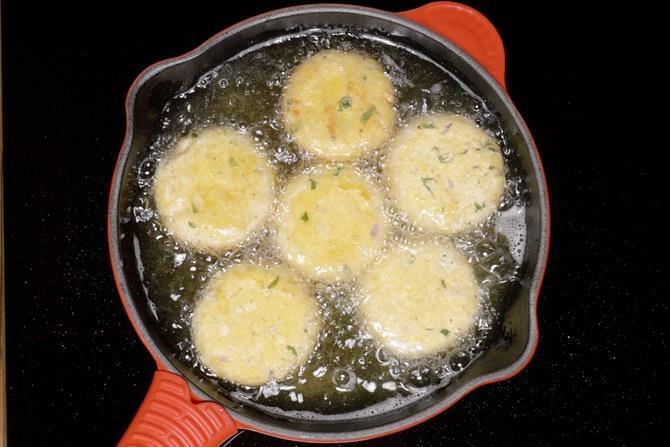 Then fry until golden and crisp on both the sides. Drain to a absorbent tissue. 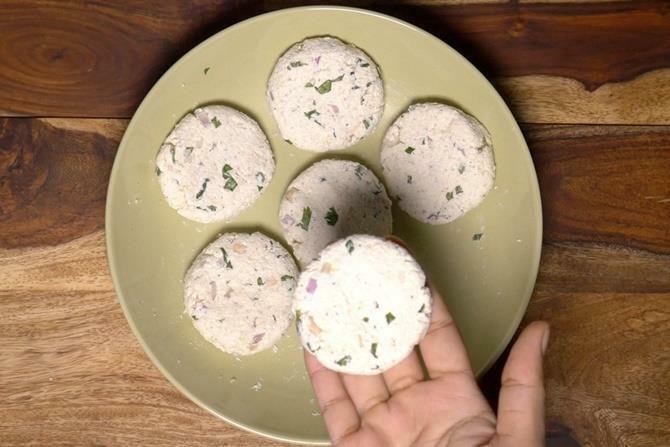 Serve dahi kabab hot with mint chutney. my kebabs always breaks what can I do to put them together, I tried with channa dal, with tofu but they all break. Sorry! forgot to reply you. Actually it depends on the recipe. Kebabs break if there is not enough binding in them. Use more flour or blend a portion of the mixture to smooth and mix with the rest. This will prevent breakage. I am adding videos to most of the recipes. Thanks again.